The Dumont Dunes are these ginormous sand dunes just north of Baker, off Interstate 15 (you know…home of the World’s Tallest Thermometer). The original Star Wars was partly filmed here — some of the Tattooine scenes, anyway! I’ve been out there twice. Once, a boyfriend and I went out to hike and look around…and some friendly redneck cruised up in a sand rail (a sort of dune-buggy contraption rednecks use to careen around on the dunes in) and offered us a tour! 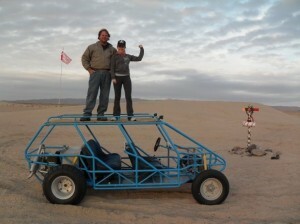 That guy took us ALL over the dunes — and that’s no joke! They are huge — and quite steep in parts. He tore down these practically sheer dune faces, much to my terrorized delight — this guy had no fear! He also took us to the far north end of the Dunes, which they call the North Pole, and which is marked by a red-and-white-striped Christmas pole with a mailbox attached, where you can deliver letters to Santa Claus! I don’t think Santa ever checks it, though, because I visited on Dec. 28 or so and the thing was still stuffed full. D’oh! Anyhoo, Thanksgiving is the big holday out there — each year, tens of thousands of rednecks bring their sand rails, dune buggies, dirt bikes and RVs and camp out at the Dunes for a weekend of racin’, chawin’ and drinkin’. I’ve never gone out for that, but it sounds amazing! I went out there one other time, for a photo shoot with a bunch of other models and my friend, the photographer Michael Maze. We met up with a bunch of wealthy enthusiasts who let us pose with their $200k (!!!) 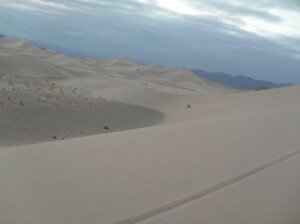 dune buggies, and then took us for a ride up and down the sheer dune faces, just like that other guy did. Fun, but if you want to do a photo shoot, there are better sand dunes…click here.